At Triton Stormwater Solutions we are committed to ensure that you get the very best product and value that you deserve. We test the products per our own internal test parameters and to the ASTM-F 2418 even though our material is totally different we still take this step so there can’t be any claims that our product does not perform as good as some others and then ship parts directly to the site. Each part is date stamped and can be traced through the entire process beginning to the date the raw material was brought into the plant and the plants are ISO/TS 16949: 2002 and a ISO-14001:2004 certified facilities. This tightly controlled quality standard is one of the reasons why Triton can offer you a superior product and is also why companies like Toyota, Honda, Hino Truck, John Deere, Detroit Diesel, Ford, GM, Pella Doors and Chrysler have used this same process to make parts for over 50 years. Unlike the competition's stormwater chambers which are made of petroleum-based resins, the Triton Stormwater Solutions Chambers are made of environmentally-friendly soy-based resin making them less expensive, yet 5 times stronger and lighter than any of the competitors chambers. This material has been in use in the automotive, underground industrial burial tank and heavy industrial farm equipment for over 50 years so the strength of the material used in the manufacturing of the Triton Stormwater Solutions Chambers is far superior than what is available in today’s’ market. Product is tested and certified by the University of the Ohio. The University's facility that tested the Triton Stormwater Solutions Chambers is the same facility used by the Ohio Department of Transportation as well as ADS pipe and chamber manufacturer. 46% greater storage capacity per linear foot than the competitions highest chamber, allowing the same water storage volume with about 20% less footprint and 20% less stone. The Chambers meet the latest AASHTO LFRD Bridge Design Spec 1. The test validates that the chambers withstand a rear axle load of 48 Kips (Kilopounds) which is 50% greater than the required H-20 loading. Online capability to create and save your system designs with a complete bill of material so you can budget using actual figures. 46% lighter than the competitors' chambers. The S-29 is so light weight that one person can carry two to three at a time. Triton Stormwater Solutions Chambers are stackable, allowing double or triple the storage space in the same foot-print. Readily Available. Made in USA, at large ISO/TS 16949: 2002 and a ISO-14001:2004 certified facility. 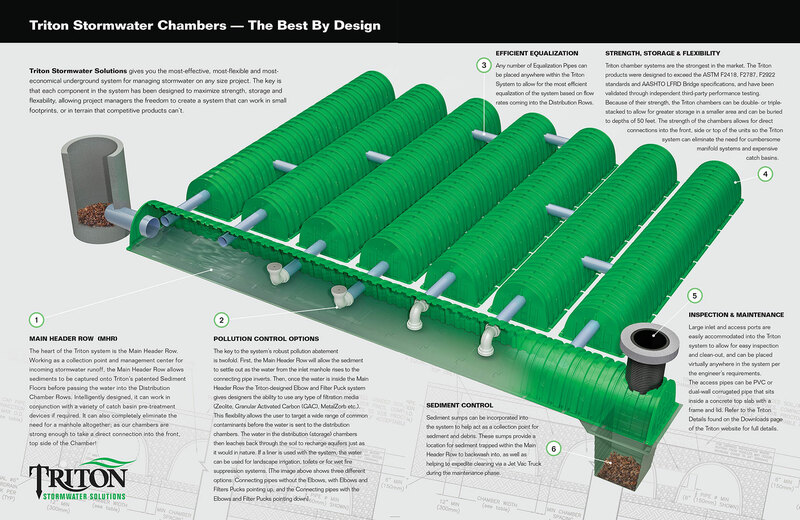 Can be used for Stormwater Retention or Detention or Rain Water Harvesting System. More environmentally-friendly Soy Oil-based resin, with more stable cost. By using the Triton Stormwater Solutions system you can achieve up to 18 LEEDs credits. Each Chamber is HS-30 stamped. Fifty year record keeping. Service life of the Triton Stormwater Solutions products are over 120 years. Federally Certified Carbon Neutral product. On Site Representation for all installations. Less than 1 week delivery for most orders. Note: This document requires Adobe Reader. Click the image below to download the latest version.